When I finished school, I started as a kitchen hand before becoming a chef. I moved to Brisbane when I was 17 and that was when I started working in bars. I eventually took up a brand ambassador position then moved to Sydney where I worked for (local spirits distributor) Southtrade. That's where I stayed for a good few years before chucking it all in to come back to Byron. Leaving the bright lights of Sydney? Why? My parents started the Brookfarm* business 17 tears ago and I'd always grown up around that - my mother started baking at home using nuts grown on our family farm and we would sell at the local markets. (Brookfarm produces quality food products using macadamias grown on their land) My parents have always been passionate about rejuvenation and using native flavours. I grew up on our farm in Byron where they started their business and I've always had an affinity for the area. So even when I left the family farm, I knew that I wanted to come back and start something. I just didn't really know what. I thought about starting a distillery about 4 years ago but parked the idea until I met Jim McEwen whilst working at Southtrade. How did you meet Jim? I was working for Southtrade, which distributed the Bruichladdich range of whiskies and Jim came out to Australia on a promotional tour as he was the master distiller of Bruichladdich at the time. (this was in 2015 or so) Whilst taking him round, we started to get to know each other and I told him about my family background, what my parents were passionate about and my idea for a distillery. Those conversations were the catalyst for me biting the bullet. When I rang my parents and they were supportive of the whole idea, I knew I had to do it. Are you still a family business? Yes, it's very much family business. My parents, my brother, Jim and I are all part owners of the business. Jim came out to get us established and help us work out the recipe for the gin but otherwise my brother and I run the daily distilling and blending operations. We have a part time sales team and some people coming in to help us bottle and do the distillery tours but otherwise it's pretty much a family affair. Jim will be back next year though (2018) and we'll be looking at some new products we can develop. What this about a slow gin - surely that's a typo and you really mean sloe gin? Sloe gin is well known to bartenders. But where I grew up, we always picked the Davidson plum and would preserve it, and it made me think why no one was using it instead of the sloe berries. The sloe berry and Davidson plum are quite similar in characteristic but the latter is native to our area. It's amazing the amount of native produce that has gotten pushed to one side in favour of their European cousins and it's really only now that we are starting to embrace it. Our slow gin is so named, in part as a reflection of the slower way of life in Byron but also to the patience required to develop the gin, which takes about 7 months to mature and develop. 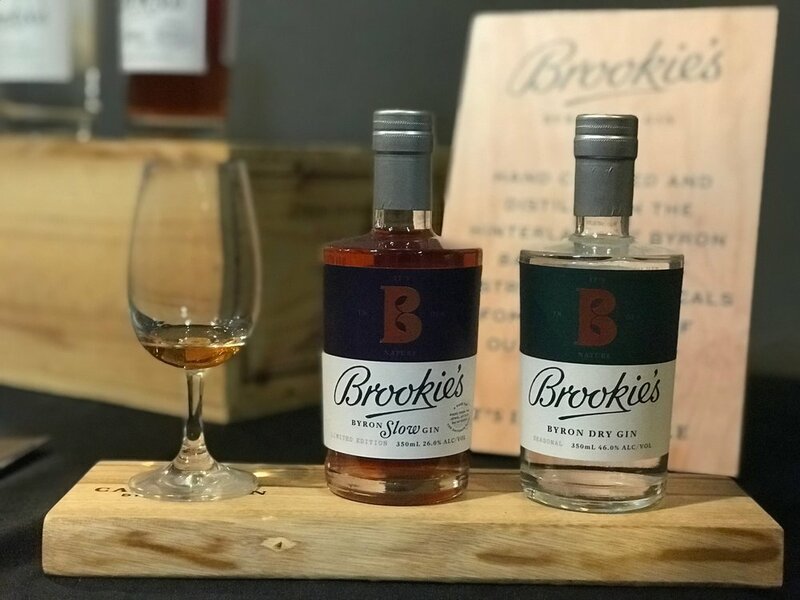 (The Brooks steep the plum in the gin over a prolonged period of time, then bring it back with a little bit of sugar to calm down the tartness). Everything is about speeding up and efficiency nowadays but when you think about it, the best things in life takes time. The slow gin isn't quite like a liqueur as we don't use that much sugar but it retains a freshness whilst still staying true to being a gin. Best cocktails you've had using the Slow Gin? I've had a couple of Charlie Chaplin cocktails at Rambling Rascal, which were great. We also do a Blackthorn cocktail as the slow gin goes well with sweet vermouth. And of course, drinking it on ice is great. There's a recipe on the back of the bottle that's a play on a Pimms Cup.